The Galaxy Note 8 will be Samsung’s large-screen phone aimed at power users, and it’s going to be big. 1. Be the first Note model released after Samsung recalled 3 million Note 7 units due to battery fires. In that sense, it’ll be the real test of the Note line’s recovery even more so than the so far incident-free Galaxy S8. 2. Give Samsung the chance to fix the S8’s biggest problem, the awkward placement of the fingerprint reader to the right of the camera lens. That could now go on the center back (like on the Google Pixel, LG G6 and Huawei P10) or — if Samsung really gets its tech together — under the glass. It could also jump on the dual-camera trend that the S8 passed up. 3. Battle Apple‘s 10th anniversary iPhone, possibly called the iPhone 8, which we expect to arrive in September. Apple is expected to pull out all the stops for this one, so the competition could be fiercer than usual. I also expect this next Note to give its digital stylus, which Samsung calls the S Pen, more tricks than last year’s short-lived Note 7 (like a speaker in the pen top — more below!). Samsung instituted this enhanced safety checklist as part of a revised testing measure after discovering holes in its battery testing that led to the Note 7 failures. The Galaxy S8 uses it too, along with every other Samsung phone going forward. It will also have something more than the Galaxy S8. “I will bring back a better, safer and very innovative Note 8," Koh said. Whatever that innovation is, it’s something Samsung is clearly reserving for the Note 8. I strongly assume that the Note 8 will feature a standalone Bixby button like the Galaxy S8 and S8 Plus. Unlike those two phones, Bixby Voice (which is a little like Apple’s Siri) should be developed enough to launch right with the phone (we’re still waiting to try Bixby Voice on the S8). We’re expecting the Note 8 to come in August if it continues to follow Samsung’s typical release cycle. Last year’s Note 7 came a little earlier than usual (early August rather than late August), but the phone has been announced before Apple’s yearly iPhone (early September) ever since the Note series began. In recent years it’s shown up in stores before the iPhone, too. But… There’s also a good chance that Samsung will want to hold off on an early August release this time around, both to triple-check that Note 8 battery safety and to strategically time the Note 8 to the iPhone 8 launch. At this point, I’d still put my money on a September arrival. The Note 7 came in at about $850, £750 or AU$1,350, so expect the cost to start there. More expensive parts, like a second camera, could hike up the price. The speculation is just beginning, but expect the rumors and leaks to mount by the week as we approach August. Until then, here are the most likely rumors right now. Samsung could one-up its own Galaxy S8, which has extremely slim bezels and curves on both sides. The company is reportedly working on a phone whose glass also curves on the top and bottom. The S8 (and Note 7 before it) curved equally on the front and back, making it symmetrical whichever side you held. The Note 8 might do the same. How about a 6.4-inch screen? The Note 8 could top the Galaxy S8 Plus’ 6.2-inch display with a 6.4-inch screen on a body not much larger than the S8 Plus. The figure comes from KGI Securities analyst Ming-Chi Kuo, Apple Insider reported. The Galaxy S8 was widely rumored to have a pressure sensitive display like Apple’s 3D Touch feature that debuted on the iPhone 6S. The rumor also extended to the Note 8, according to “sources" cited by Korean outlet The Investor. I’ve said this before, and I’m not the only one to think that Samsung’s saving the best of its camera upgrades for the Note 8. Analyst Kuo agrees, stating that the dual-camera mount may be the biggest significant design change from the S8 family to the Note 8, stylus notwithstanding. I’ve been waiting for ages for the S Pen’s cap to do something really cool, like erase when you flip it over. The rumor that it will contain a speaker might be even better. A speaker within the S Pen top could shoot audio out of the pen, making it replace the speaker grille. Does that mean it could also talk to you, or that you could talk to it? We’ll find out! iPhone 7 Pre-orders underway as of September 9, launches September 16. Apple’s iPhone 7 and 7 Plus are Apple’s newest iPhones, with significant camera improvements, a new glossy black color, better battery life, faster processors, and improved water resistance implemented through a flush home button and no headphone jack. The new iPhones will launch on September 16, with pre-orders underway as of September 9. After months of rumors, the iPhone 7 and iPhone 7 Plus are here in the flesh! Apple announced both today at its launch event in San Francisco. If you always wanted water resistance and better battery life on your iPhone, you’re going to be happy. If you wanted a headphone jack, you’ll be sad. Updated 4:15 p.m. PT: Additional hands-on impressions. We got to use one hands-on for a few minutes after Apple’s event. Obviously, you can’t appreciate water resistance in a demo room (at least, not Apple’s demo room). But the iPhone 7 seems like a bunch of upgrades — some of which iPhone users have wanted for a while. Did we mention no headphone jack? Yes, it’s weird. Also, the home button being a solid-state Force Touch-like panel means it doesn’t quite have the same feel. It took some getting used to. Jet black, Apple’s new glossy black color iPhone, looks beautiful. It turns the iPhone into a slim black obelisk. But it also might be a bit of a smudge magnet. Size and feel: The iPhone 7 feels pretty much the same as the iPhone 6S, with the same 4.7-inch screen. Apple says the “HD Retina display" is 25 percent brighter than last year’s model. It includes the pressure-sensitive 3D Touch layer that buzzes slightly when you press and hold the screen. Static home button: The home button is now solid state, which means you can’t physically press or click it in — kind of like the Motorola Moto Z and OnePlus 3. It’s pressure-sensitive, including “taptic feedback", which just means that apps can give you three levels of pressure and haptic feedback, like a light or strong buzz. It doesn’t feel like a button and definitely takes getting used to, but so far it seems to get the job done. Water-resistant: Yes, Virginia, it will be water-resistant (IP67), like several Samsung and Sonyphones (IP68). Cannonballlll! No headphone jack: It’s gone. Really. Instead, Apple’s new EarPods headphones will connect through the Lightning connector port; you’ll also get an adaptor in the box. Apple’s also pushing new, funky-looking AirPods headset connects wirelessly through auto-pairing. These worked pretty well, actually, and sounded pretty good in a the loud demo room. New camera: The iPhone 7 keeps the 12-megapixel camera, but adds a larger aperture and — this is a big deal — optical image stabilization that keeps images steadier. We do notice that the camera sticks out more from the back. (The iPhone 7 Plus gets a second, 56mm telephoto lens on the back that works like a built-in zoom feature. Phones like the LG V20, Huawei P9 and Huawei Honor 8 have two cameras, too.) We have lots more detail below. That home button doesn’t click in. New front-facing camera: The iPhone 7’s 7-megapixel front-facing camera leaps up from 5 megapixels on the iPhone 6S, and includes auto-image stabilization (but not optical image stabilization). Stereo speakers: A second speaker joins the iPhone to give you stereo speakers. There’s now one at the bottom and one at the top (this is brand-new for Apple). Longer battery life: Greater battery capacity for longer battery life. Apple estimates 12 hours of LTE browsing (the iPhone 7 Plus should clock about two more hours). Apple notoriously never tells us what the capacity is. Salesforce plans to acquire Quip, an online word processing service, the company announced August 1 in an SEC filing. The cloud-based startup will cost Salesforce about $582 million in stock, the CRM giant reported. This does not include previous investments Salesforce Ventures had made in Quip, which were not shared in the filing. However, some sources put the total price at $750 million. This figure comes from TechCrunch, which cites two sources “very close to the deal." Quip was founded in 2012 by former Facebook CTO Bret Taylor and Kevin Gibbs, who had previously worked in Google’s infrastructure group, reported The Wall Street Journal. The startup had raised $46 million in venture funding. Quip’s mobile-friendly productivity platform aims to change the way people collaborate so that they don’t have to rely on email. The idea is to let users create and manage documents together with built-in chat capabilities. A “Smart Inbox" lets users manage current documents, and chat is built into all documents and spreadsheets for quick messaging. Users can have one-on-one personal chats with team members, receive instant updates with smart notifications, and enter items into documents with @mentions. While Quip has a desktop app and web version, its user interface is designed to be mobile-friendly so that users can continue working on the go from their smartphones and tablets. In a blog post on the acquisition, cofounders Taylor and Gibbs commented on the software philosophy Salesforce and Quip share. The two companies believe software should be in the cloud, inherently social, and built for mobile use. “As part of Salesforce, we will be able to expand our service more quickly and reach millions of people all over the world," they wrote. “And, we’ll be able to extend the Salesforce Customer Success Platform in powerful new ways with our next-generation productivity capabilities," they continued, noting the power of mixing data, content, and communication. Salesforce CEO Marc Benioff confirmed on Twitter that both Taylor and Gibbs will stay with Quip. 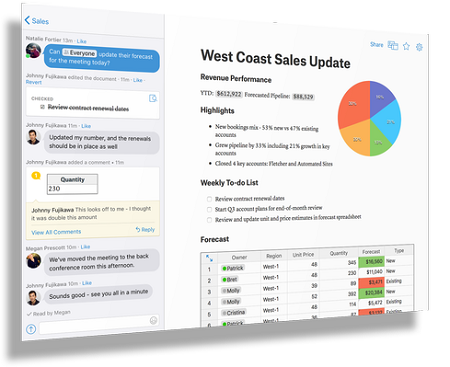 The Quip team has also committed to expanding Quip’s productivity platform as part of Salesforce. He noted that current customers will continue to receive its products and services. The acquisition of Quip puts Salesforce in a position to better compete with productivity platforms Google Drive and Microsoft Office 365, whose companies are also trying to position them for the future of mobile work. Salesforce has been browsing acquisitions over the past few months. In June, the company paid $2.8 billion to buy Demandware, a purchase that strengthened its position as a leader in customer resource management that adds an e-commerce capability that Salesforce previously lacked. While Salesforce also collaborates with Microsoft, this acquisition will give the company a boost to compete with Redmond. Prior to its acquisition of Demandware, Salesforce had also made a bid for LinkedIn, which was ultimately acquired by Microsoft for a hefty $26.2 billion. Benioff confirmed the bid, Re/code reported. Funding for cyber-security companies is either slowing down or speeding up, or it’s doing both at the same time. According to CB Insights, the deals and the dollars are flowing less freely than they did in 2015. The research firm anticipates some $3 billion being invested across more than 300 deals this year, but that’s less than the $3.75 billion poured into 336 deals in 2015. Companies focused on enterprise data and network security continue to attract investor interest. Also, companies that offer predictive intelligence and smartphone security continue to get funded. The most significant cybersecurity funding so far this year has gone to Cylance ($100 million), Mobi Magic ($100 million), and LogicMonitor ($130 million), the research firm said in July. Yet in May, Lux Research said venture funding for cyber-security will reach $400 million in 2016, up from $228 million in 2015. These figures aren’t necessarily contradictory, however. Lux Research is looking at “cyberphysical security startups," a different slice of the pie than CB Insights considers. Lux Research is focused more on pervasive computing and IoT. While funding priorities may be shifting, market demand for cyber-security overall appears to be on the rise. Gartner said the worldwide market for information security reached $75 billion in 2015, a 14% increase from the year before. The firm anticipates further growth in areas such as IoT security. A Feb. 2016 report from The SANS Institute found that, where security spending as a percentage of overall annual IT budgets was above the lowest range (0% to 3%), security budgets are growing over the 2014 to 2016 period. The SANS Institute findings indicate that financial services firms expect security to get 10% to 12% of the IT budget in 2016, up from 7% to 9%. It found that government organizations expect to see security account for 7% to 9% of the IT budget this year, up from 4% to 6% in 2015. In other sectors, security spending is expected to remain flat, apart from education, where it is projected to decline this year. Spending on cloud infrastructure should increase by 15.5% in 2016 to reach $37.1 billion, according to IDC. It stands to reason that some of that will be invested in security. According to Morgan Stanley, cloud security spending accounts for only a small portion ($4 billion) of overall cyber-security spending. But the firm sees cloud security growing much faster than on-premises solutions in the years ahead, moving from 12% of security spending in 2015 to 20% of security spending in 2019. There are well over 100 cloud security startups hoping for a piece of the IT budget. Here are a few IT managers may wish to consider. Uber’s business model depends upon drivers who aren’t employees. The transportation company itself has about 6,700 employees. It maintains that its 400,000 drivers in the US are independent contractors. If Uber had to pay employment benefits for its drivers, the company would be in a far different financial situation from the one it’s in today. Uber was sued in 2013 in California and Massachusetts because it classifies drivers as independent contractors rather than employees. That case was scheduled for trial in June of this year, but in April, Uber chose to settle for $100 million (or $84 million if the company does not go public), leaving the company’s characterization of its relationship with its drivers intact for the time being. Smaller startups playing in the “gig economy" like Honor, Instacart, and Luxe have decided to pay employee benefits rather than risk a legal confrontation. Yet their caution limits positive aspects of working outside of the traditional employer-employee relationship, such as the freedom to set one’s own working hours. For companies considering whether they can have a different kind of relationship with workers, it’s not clear whether Uber’s arrangement with its drivers has applicability for other organizations. If you have a lot of business calls while traveling, whether incoming or outgoing, you know how hard it can be to remember every single word that was spoken. You may have tried call recording apps, but some have you fumbling to record the call. A new app from Yallo, Call Recorder, records your calls automatically and the recordings are accessible immediately. Making calls with the app is as easy as selecting your contact or dialing the number. It works just like your phone’s dialer. As soon as you place the call, the app begins recording the conversation. Incoming calls are also recorded automatically, so you don’t have to worry about merging calls or pressing buttons before or during your call. You can access your recording quickly after the call has ended and replay it, mark it as a favorite, label it, send it to your email address, or even delete it. There is no limit to the number of recordings you can save or the amount of time for the call, plus the recordings are saved in the cloud rather than on your device to alleviate storage concerns. Call Recorder is available at no charge and all incoming calls are free, which is terrific. There are some limitations, however, with incoming call availability for several countries and you can view that list on the App Store. Outgoing calls require credits and new users receive a free one-time credit. After that, you can purchase more via in-app purchase, by watching a video, or by sharing the app with friends. And, rates vary depending on the country you are calling. Obviously Call Recorder is a handy app for business people and frequent travelers, but there are other reasons for recording your calls too. Wouldn’t it be nice to replay the conversation you had with your grandkids? Or, wouldn’t you like to listen to your significant other’s voice again when you are many miles apart? If so, Call Recorder may be just what you need. Call Recorder is designed for both iPhone and iPad and available for free on the App Store. In-app purchases for calling credits start at $0.99. In other news, check out Once again, Apple is said to be developing high-res audio formats or Grab Apple’s Beats Pill+ speaker for $100 off from Best Buy. Scanner Pro, the popular document scanning app (and chief competitor to Scanbot), continues to improve as it sticks to its promise of turning iOS devices into portable scanners. Developed by Readdle (which makes other acclaimed productivity apps such as PDF Expert and Spark), Scanner Pro allows you to easily scan documents, receipts, tickets, and more using your iOS device’s camera, with automatic border detection and shadow removal at that. It then lets you save or share your scans as multi-page PDF or JPEG files. And with its latest update, Scanner Pro has gained several enhancements of note. A couple of these enhancements have to do with how the app names scans. By default, Scanner Pro names new scans with the template, “Scan [Date], [Time].” But now, you can now customize the default scan name by going to the app’s settings icon (just tap the gear icon), tap the option for Default Name, and edit the current template, choose from the available templates, or create a new template using the available temporal variables. Whatever you set will then be used for future scans — until you change it again, of course. The new version of Scanner Pro also features something called smart renaming. Now, when you rename a scan, there’s a bar right above the keyboard that suggests “the words and dates you probably need to type next.” This enables you to rename your scans more quickly and easily. The latest update to Scanner Pro also introduces new tools that allow easy management of scanned pages, as when you need to make duplicates of pages or merge documents into one. Now, you can easily copy and paste pages between documents or within the same document by tapping the appropriate buttons in the bottom toolbar after making your page selection. You can now also easily move and merge your documents within the app also by tapping the appropriate buttons in the bottom toolbar after making your document selection. The new version of Scanner Pro also introduces integration with the cloud storage service Box. This update is just the newest one to bring notable enhancements to Scanner Pro. It follows a update in October that added support for 3D Touch Quick Actions and Peek and Pop, Spotlight search, and iPad multitasking, and another in November that optimized the app for the iPad Pro. Scanner Pro was updated to version 6.0 in July with a new design, scan re-editing, favorite file destinations, OneDrive and OneNote integration, automatic scanning, and a new Scan Radar that finds documents for scanning in the camera roll. Compatible with iPhone, iPod touch, and iPad running iOS 8.0 or later, the new version of Scanner Pro is available now on the App Store as a free update or as a new paid download. Normally priced at $2.99, Scanner Pro is on holiday sale for a limited time (along with its fellow Readdle apps) for only $0.99. Apple has publicly condemned the United Kingdom’s recently proposed investigatory powers surveillance bill, arguing that for the majority of law-abiding customers, the move would effectively serve to “weaken security,” according to a recent report. The news comes from the Guardian, which explains that Apple, on Monday, made a submission to the bill’s committee in which it voiced concerns regarding the move. You see, the investigatory powers bill would require companies operating in the United Kingdom to store the details of website visitors for at least 12 months, and to make this information readily available for law enforcement agencies (if required). Home Secretary Theresa May presented the bill in November to the House of Commons, and it’s currently awaiting committee approval. For now, the bill is subject to approval by its committee. As such, it remains to be seen whether the British government will make a U-turn on the move. Here’s a treat for iPhone owners with a Lightning to USB Camera Adapter: under the recently released iOS 9.2, folks with an iPhone 5, 5s, 5c, 6, 6 Plus, 6s, or 6s Plus will be able to connect their smartphone up to a digital camera in order to import images right onto their handset. Apple is indeed listing all iPhone models as compatible devices at the product page for its Lightning to USB Camera Adapter, and it seems compatibility for the adapter was added in iOS 9.2 (which launched for users earlier this month). Before now, the product had only worked with iPad models, which made sense in a way; the larger screen of Apple’s tablet made it more of a suitable device for handling large numbers of imported images, making edits, and ordering prints. The release of more powerful, larger-screened iPhones in recent years, however, makes Apple’s smartphone more of a capable device for photographers, and as such it’s great to see support for the iPhone added to its adapter. The adapter works by allowing users to plug a USB cable connected to their DSLR camera into their iOS device; in this way, users can transfer images over to iOS without having to remove an SD card. Earlier this month, Apple made a change to its Lightning to SD Card Camera Reader especially for iPad Pro owners: Cupertino replaced the cable with a brand new device capable of transferring data at USB 3.0 speeds. The iPad Pro includes a USB 3.0-compatible Lighting adapter, and as such, the improved Lightning to SD Card Camera Reader would allow users to transfer data at 10 times the rate previously possible. According to 9to5mac, however, it seems the updated Lightning to USB Camera Adapter doesn’t support USB 3.0 speeds for iPad Pro owners. This is too bad, but we’re nevertheless pleased to see iPhone compatibility added to the accessory (even if iPad Pro owners are still limited to USB 2.0 speeds). You can order the new Lighting to USB Camera Adapter now from Apple, and it carries a price tag of $29.00. In order to connect an iPhone handset to the cable, you’ll need to have iOS 9.2 (which is available now inside of Software Update) installed. Last updated by horkykwok at 2017-05-16 .